Coco Rose Body Polish Review (2018): Is It Really Worth Buying? 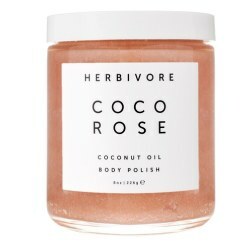 Herbivore Coco Rose Coconut Oil Body PolishReview : Ingredients, Side Effects, Detailed Review And More. What Is Coco Rose Body Polish? Herbivore Coco Rose Coconut Oil Body Polish, US $36 for an 8 oz. jar, is an all-natural body moisturizing scrub that brings together the exfoliating power of sugar, the intensely hydrating properties of rose flower oils, and the healing capabilities of coconut oil. Herbivore is a skin care company that concocts its products from scratch and handcrafts it in Seattle, USA. The company is strongly committed to making available better alternatives to beauty and skin care made only from the finest that nature has to offer — no toxic ingredients, no ingredients derived from animals — that includes the finest minerals, vitamins and botanical extracts. However there are many other well known brands in the market with similar effects and ingredients and they come in a affordable range. Coco Rose Body Polish — Does It Really Work? Replenish lost nutrient and moisture levels to promote healthier skin. Promote faster skin repair and rejuvenation by introducing more plant-based proteins into your skin that can be easily assimilated to facilitate skin healing. Significantly drive up your skin’s antioxidant levels. Deliver a cooling and soothing sensation that helps relieve skin irritations and other signs of inflammation. What Are The Ingredients In Coco Rose Body Polish? Virgin Coconut Oil: It has natural antibacterial properties that promotes skin clarity and also contains rich amounts of fats and proteins, the kinds that can be easily assimilated to boost skin mechanisms for repair and renewal. Rose Flower Oils: Derived from Moroccan Oils, it promotes better skin hydration, has natural anti-inflammatory properties, and helps tighten and smoothen your skin’s surface. Sugar Granules: Gently scrubs and exfoliates your skin to encourage faster skin regeneration and renewal, as it promotes a brighter overall skin tone. Shea Butter: It contains rich amounts of fatty acids and Vitamin A that renders anti-aging properties. After showering, apply Coco Rose Body Polish on damp skin. Massage gently to exfoliate then leave on for two minutes to allow the product’s beneficial ingredients to penetrate your skin before rinsing off. Pat dry and immediately follow through with your favorite body moisturizer or cream. Coco Rose Body Polish is made only from botanically sourced ingredients, all natural, and no toxic fillers and preservatives added. Although it may be allergic to certain skin types. This product renders therapeutic properties that rejuvenates your skin and your senses as well. This product is packaged in a transparent jar that promotes unhygienic use and would hardly keep the therapeutic powers of its natural ingredients intact for too long. Herbivore Coco Rose Coconut Oil Body Polish reviews indicate that users prefer very different intensity of scrubbing, the more intense ones cannot be rendered by the sugar granules included in this product. This product is comparatively higher. This product has a unpleasant smell. Does Herbivore Coco Rose Coconut Oil Body Polish Have Any Side Effects? Based on the ingredients and reviews, the only side effects that may be experienced when using Herbivore Coco Rose Coconut Oil Body Polish are allergies and irritations, depending on your allergy history and your skin’s response to these product’s components. Herbivore Coco Rose Coconut Oil Body Polish could be a refreshing, yummy new addition to your bath and shower. The natural ingredients spoil your skin. However, while this product, without doubt, can be moisturizing, the longer-lasting age-defying claims require more proof. When it comes to anti-aging skin care, scientific evidence means everything. Facial moisturizing products are in no short supply today, and this large selection might make the process of choosing the best moisturizer for your personal needs to seem a bit overwhelming. Fortunately, we've taken the time to research each of the top facial moisturizers on how they rate in several different key categories. More specifically, we believe that every quality moisturizer should provide the basic benefit of improving overall facial skin appearance, including both skin tone and skin texture. Additionally, a quality moisturizer should contain compounds that are capable of binding to collagen fibres in order to provide the most long term results. Finally, facial moisturizers should ideally be able to deeply cleanse skin at the same time that they moisturize it. Below is a summary of our findings regarding the top facial moisturizers and these key considerations.